This adorable little green-roofed Casa VSP+JUR isn't trying to show off. Set at the back of a very large property and masked by surrounding foliage, the 1,000 sq ft home was given Sanzpont Arquitectura's total attention and focus to give it the the smallest footprint possible. Not only does the green roof replace the vegetation cleared to build the house, but it also acts as a natural form of insulation. Other features include an ecological septic tank and recycled ground water. The sloping green roof is very attractive and helps the home snuggle into its environment. Sanzpont was focused on ensuring that their imprint remain as discreet as the home’s overall environmental impact. Included in the sustainable design are an ecological septic tank that treats human waste, an irrigation canal system, and landscaping irrigated using recycled groundwater. Lastly, the interior energy efficiency is amped up with daylighting and savvy power-saving technologies. 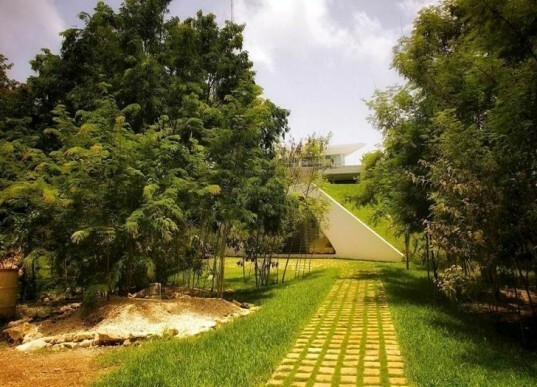 Built in Cancun on an 18,300 square foot patch of land, the home displaced a very small percentage of the property. Otherwise, all of the existing trees were preserved. These help to keep solar radiation from the west to a minimum while maintaining the green aesthetic. The building may be small, but it's packed with sustainable goodness. It is set on the back end of a 18,300 square foot property. The green roof replaces the foliage area cleared to build the home. But it also provides natural ventilation. All of the existing trees were kept standing. Which maintains the overall natural aesthetic while simultaneously reducing solar radiation from the west. Finally, savvy power-saving technologies on the interior of this small, 1,000 square meter home have created huge energy savings.